I’m playing with my Office 365 Plan E3 Technical Preview subscription for a quite a while now, and I think it’s just great! In this post, I want to guide you through the process of adding a custom domain to your subscription. 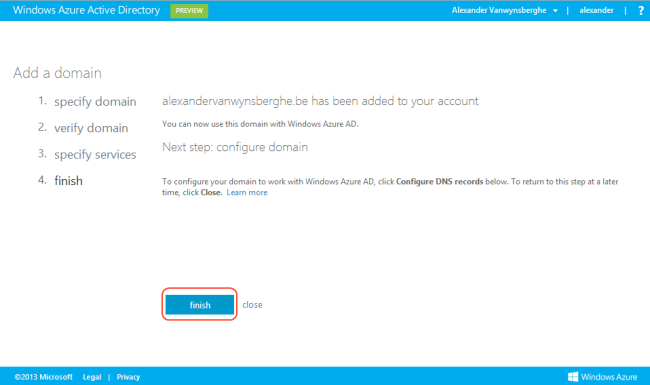 The way I will show it is by using the Windows Azure Active Directory portal, which I will explain right away. Windows Azure Active Directory (Windows Azure AD) is a modern, REST-based service that provides identity management and access control capabilities for your cloud applications. Windows Azure Active Directory provides a cloud-based identity provider that easily integrates with your on-premises AD deployments and full support of third party identity providers. Alright, that being said, let’s move on and add a custom domain to our subscription. 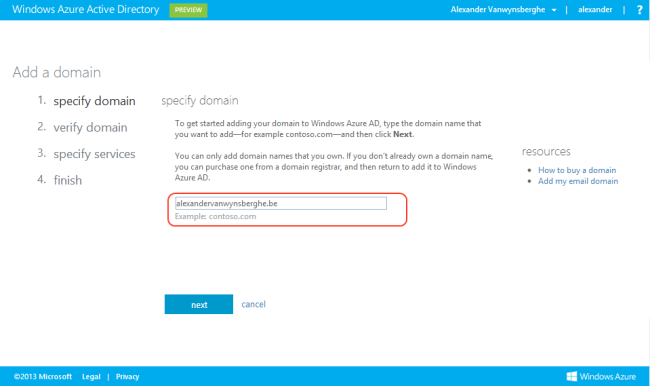 By default, your subscription domain will be something like yourname.onmicrosoft.com. That’s great, but using your personal domain is a much more professional way of working of course. Let’s do that now. First, click on the ‘domains’ link on the left side. You will see that the *.onmicrosoft.com is already listed there by default. Click on the ‘Add a domain’ button. If you click ‘next’, the service will check the TXT record and you will be able you continue the process. In my case, it only took a few seconds for the TXT record to be applied. In other cases, it can take bit longer. The next step is to select the domain services. In other words, which services will be used with your domain? I selected ‘Exchange’ and ‘Lync’. 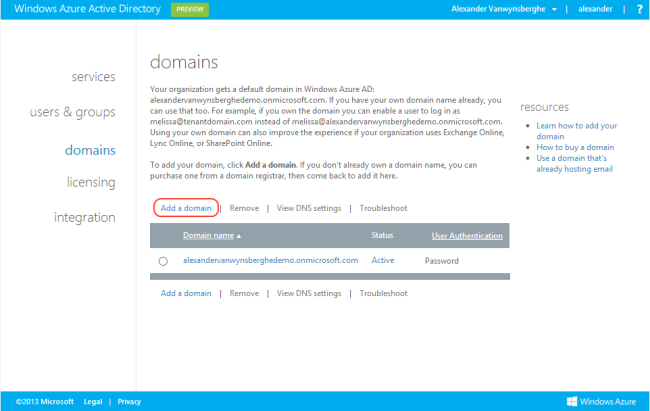 Don’t select SharePoint, because the DNS record that you create to enable SharePoint Online for this domain by default restricts all other DNS records from working. What you can do is create a CNAME record with the WWW prefix, and point it to yourname.sharepoint.com. 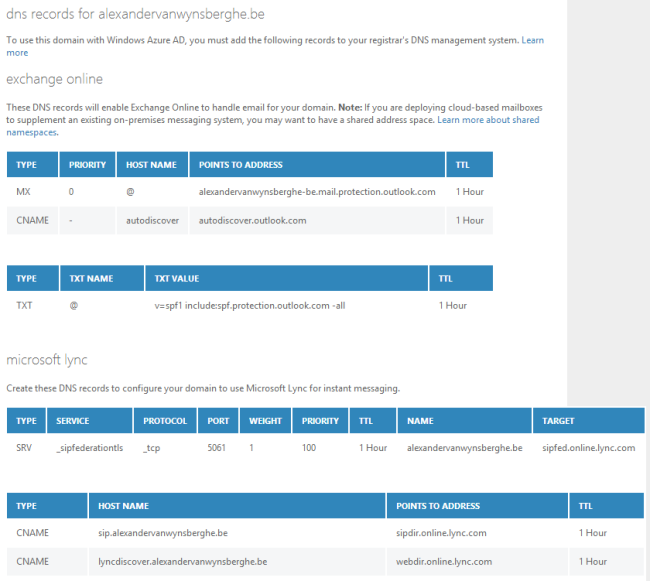 Or even better, yourname-public.sharepoint.com, so it will link to the public website. 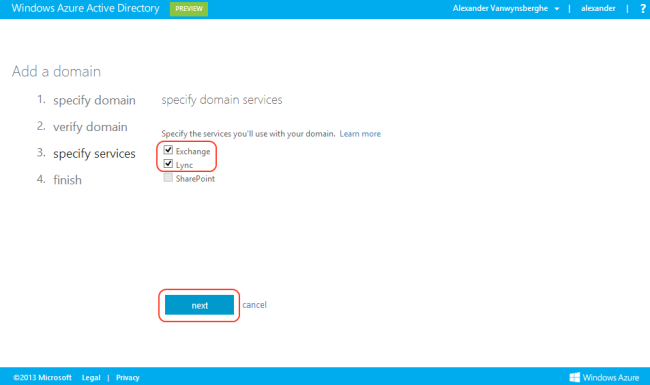 You can then create another CNAME record with the PORTAL prefix, and point it to the SharePoint sites root. That’s it, your domain is ready to be used, meaning that it’s added to your WAAD account (and thus can be used with your Office 365 subscription). That should do the trick, you can now send an email to ‘abc@mycustomdomain.com’, and it should arrive in the mailbox of the user you just configured. Google Apps is not free anymore. Not a problem for me, as an existing user. But I don’t like the direction that Google is taking with this decision. Well, because of that, I decided to make the move. I’ve been a fan of Outlook.com since it was released, so it was the right time to make the switch. 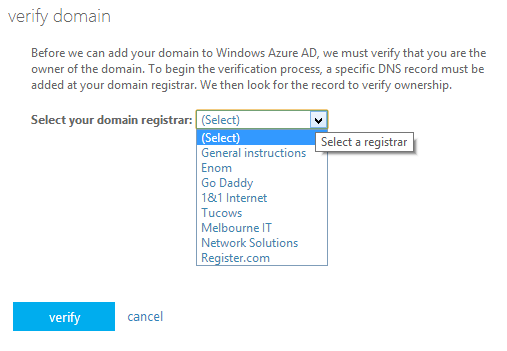 In this post, I will describe how you create your own custom domain, the DNS settings you need to make, and how you can make e-mail aliases. First things first, we need to create a custom domain using http://domains.live.com. Sign in with your Live ID. Note that it can be one from your custom domain. In my case, I already had a Live ID making use of mydomain.com. Once you’re signed in, click on the ‘Add Domain‘ button. 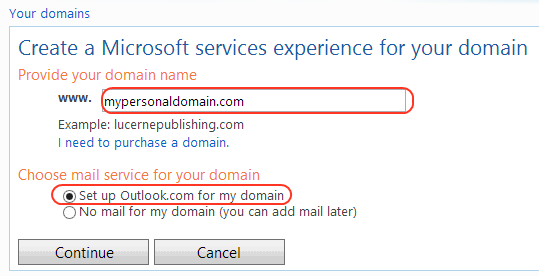 Enter your domain name, and select ‘Set up Outlook.com for my domain‘. Review and accept the next screen. Once you’ve added the MX record, you can click on the ‘Refresh‘ button. If everything went correct, you will now be able to add some ‘Member accounts‘. Click on the ‘Add‘ button to create a member account. Enter the account name, for example ‘firstname.lastname@mypersonaldomain.com‘, a first name, last name and password. Click the OK button to add your account. In fact, that’s all you have to do. You can go to mail.live.com and log in with your new account. Note that you will still see the old ‘hotmail’ look, but you can simply change it to Outlook.com using the options button on the right. One import part, although for me, is the fact that if you already have a Live ID using this custom domain and you enable ‘mail’ for this custom domain, it will automatically create that user in the ‘Member Accounts. For example, I had a live ID alexander.vanwynsberghe@abc.com. This Live ID also had an Outlook.com inbox, but it was empty off course. But by creating a custom domain, and enabling the mail option on domains.live.com, it automatically created a member account ‘alexander.vanwynsberghe@abc.com’. That’s all I had to do. One thing that is missing from the ‘Windows Live Domains’ is the ‘Alias‘ feature. Well, in fact it does exist, it’s just not available from the interface. It’s possible to create aliases using the Admin Center SDK. After some Bing’ing (I couldn’t be the first one with this problem), I found a nice and easy solution to manage my aliases. It’s called WLALIAS. This is a command-line based tool making use if the Windows Live API. Alias is the name of how your alias will look like. That’s it. My e-mails are now using Outlook.com, I’m happy! One thing that you also have to do off course is moving your ‘old’ Google Apps mails to Outlook.com. You can do this by enabling POP on Google Apps, and link this POP account to your Outlook.com account (but this can fail, mainly if you have lots of e-mails). Another option is to use the Outlook client. Simply add the 2 accounts (Google Apps and Outlook.com) and copy paste your folders.